If I then replace arc[...] with --, the code typesets fine. If I keep arc[...] but remove \tikztonodes, it typesets fine too. Is this a bug? Is there a workaround? First, I forgot to mention I used pdflatex and that my distro has tikz/pgf version 3, according to the documentation. Then, thanks to @percusse and @cfr, the syntax error is gone but now the placement is not working. 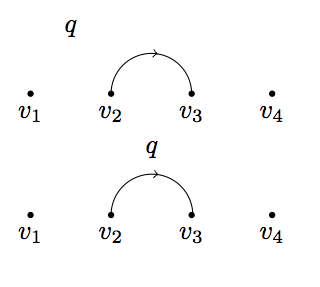 It has nothing to do with \tikztonodes or even with styles actually, as demonstrated by the following snippet where the half loop is drawn "by hand". I added labels to the vertices and contrasted two approaches which should be equivalent imho. The version with let ... in ... and the version without do not put the label q at the same place as shown on the following rendering. This is a bug, surely? I have filled a bug report. Thanks a lot to all of you who have given answers. My conclusion: the Tikz is too brittle to base my work on it. I will try to develop a solution based on the PGF basic layer instead.